Ekiti State Governor, Ayodele Fayose, has denied allegations by the Economic and a Financial Crimes Commission, linking him with funds from the Office of the National Security Adviser, saying his 2014 election was funded by Zenith Bank Plc, fund raisers, donations from friends and associates as well as sales of campaign souvenirs. “I have no financial transaction whatsoever with the Office of the National Security Adviser (ONSA) under Col Sambo Dasuki (rtd) and former Minister of State for Defence, Senator Musiliu Obanikoro either by cash, cheque or electronic transfer,” Mr. Fayose declared in a statement signed by his Chief Press Secretary, Idowu Adelusi. He challenged the EFCC to publish statements made by Musiliu Obanikoro, his son or other persons associated with funds from the NSA’s supposedly used for his governorship election. “EFCC is only acting a movie scripted, produced and directed by the All Progressives Congress (APC) government of President Mohammadu Buhari just to silence me being a major opposition voice in the country,” he said. 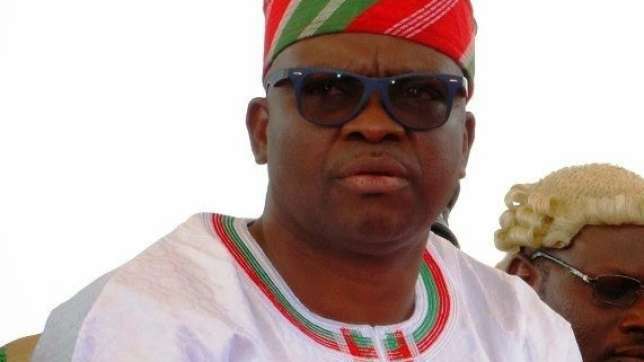 The EFCC, in justifying its restriction on the account of the governor, said it had traced funds from the office of the NSA to the accounts of Messrs Fayose and Obanikoro. The commission said the funds, amounting to about N4.7billion, was moved from accounts operated by two of Mr. Obanikoro’s sons where it was transferred to Mr. Fayose’s Zenith Bank Account in Ado-Ekiti. On the alleged involvement of President Buhari’s wife, Aisha, in the Williams Jefferson scam, the governor challenged the president’s wife to visit the United States of America to convince Nigerians that she was not the Aisha Buhari mentioned in the judgment. Speaking further on funds for his election, the governor said the management of Zenith Bank, which largely funded his election, had in a meeting prior to his election gave him assurance that funds would be provided for the election. “I was asked to nominate a trusted ally to be related with and I nominated Mr Abiodun Agbele,” the governor stated. “In actual fact, the account was opened by Zenith Bank hurriedly at that time and Abiodun Agbele’s identity card which ought to have been collected before the account was opened was only collected last week in the bank’s desperation to perfect the account obviously after submitting to the intimidation and harassment of the EFCC. “Most of the funds posted into Agbele’s account were through the Ibadan, Akure and Lagos branches of the Zenith Bank and sometimes they brought cash. “Assuming but not conceding that cash moved from Lagos to Akure as being claimed by the EFCC in its usual manner of media trial, was meant for my election in Ekiti, why was the cash not moved to Ado Ekiti branch of Zenith Bank or the cash handed to me directly? “Why was it deposited into Zenith Bank, Akure and did the bank make any report on the transaction to the appropriate authorities? Why did the bank send its bullion van to move the money from Akure Airport to their Akure branch if it was illegal money? “I must say it categorically that I don’t have any link financially with Obanikoro and I know as a fact that he (Obanikoro) has not; and cannot mention my name, as beneficiary of whatever money any company in which he has interest could have gotten from the ONSA if truly Obanikoro collected money from the ONSA as being claimed by the EFCC. The governor, challenged the EFCC to also beam its searchlights on the funding of APC elections, especially that of President Buhari. “Since we are now in the era in which financial assistance from Nigerians to fund elections is being criminalised, the international community, especially those funding EFCC must insist that the commission probes the funding of APC elections before further funds are released to the commission,” he demanded. Mr. Fayose pointed out that the action of the commission was a plot to intimidate and harass him into submission, but vowed that he would not be cowed by threats of incarceration and death. “I advise that they should keep their gun pounder dry and wait till the end of my tenure in 2018 and I want to assure them that I will be available to answer any of their questions, no matter how unreasonable,” he said. “Furthermore, Nigerians should know that I have been persecuted by the EFCC before, using phantom N1.2 billion poultry scam and I came out victorious. I was not only acquitted, I got N10 million judgment against the EFCC and my impeachment that was orchestrated by the EFCC was quashed by the Supreme Court.